The first years of a child’s education can set the course of his or her life. That’s why it is vital to rouse their curiosity and provide a rich environment for learning and growth. Our programs incorporate dynamic classroom instruction with caring, qualified teachers and enriching indoor and outdoor play experiences. We know that these first experiences within a school setting will have a long lasting impact on their future academic success. Each of our programs provide a strong curriculum and dedicated teachers, who are trained and skilled to meet the specific needs of the age group they care for. Numerous staff have been with us for more than 15 years, and some as long as 30 years. This continuity of staff is important to the child’s environment as he or she moves through the various classrooms and programs. 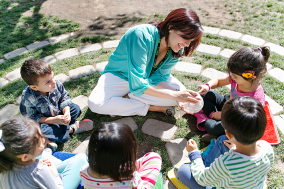 The overall experience at Turtle Rock Preschool promotes a love of school while nurturing social, emotional, physical, and cognitive development. We invite you to visit our school and see for yourself the exceptional learning that takes place. Our youngest program for Infants starts as early as 8 weeks of age. We’ve purposefully designed a nurturing and creative world for infants to help their minds and bodies develop. Every moment with an infant is precious, which we make sure to treasure. Children then move to our Toddler program at one year old. We begin to balance individual attention with group activities and ensure that your child is using all of his or her energy and excitement in productive ways. Our teacher’s tender care meets children’s emotional needs while promoting beneficial social skills and early learning. 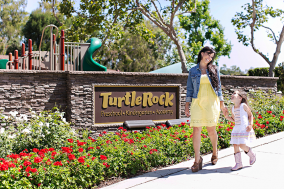 The journey from Preschool to Kindergarten at Turtle Rock is a cohesive progression. Ideas and skills build, year upon year. We craft a curriculum specifically for each stage of development, so every year brings new challenges and new adventures. Our Preschool program, for two year olds, is where friendships begin to develop and children gain confidence as they use their words and thoughts to interact with others. We allow children to express themselves creatively and encourage all children to develop their unique skills and interests. As they enter our Junior Pre-Kindergarten program during their third year, your child’s world opens up in new ways. At this age children improve coordination, learn more complex games, begin to interact more deeply with others, and become more curious. It is this natural sense of curiosity that we use to inspire them to learn and grow. 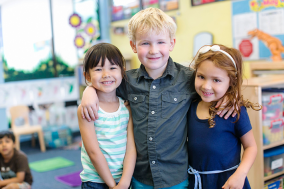 Getting children ready for the leap to Kindergarten, our Pre-Kindergarten program is designed to enhance a child’s cognitive, social and emotional development. This environment allows children to develop skills that form the foundation for reading, writing and mathematics. Our Private Kindergarten introduces children to a more formal education in a safe, comfortable environment. Throughout the year, we provide a comprehensive, learning-centered approach that challenges children and supports all areas of development.